Do you have a tablet or smartphone and only use it for one or two functions? Do you want to find out what else your device can do? This book is a compilation of a weekly mailing list I wrote for my employer. 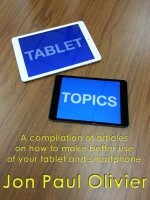 With their permission, I have released it as a free e-book to show many of the things your mobile device is capable of. From the office, to the home, to vacation, read about things you might have not thought of using your tablet or smartphone for. This book will be updated as additional articles are released, so check back for updates. Jon Paul Olivier watched others struggling to fit in as well as been that person trying to fit in. Along the way, he has looked for the little details, the things in the background, that make stories real. In time, encouraged to write down the stories he told, he started writing tales inspired by his travels and by the people he met along the way.